Porcelain is prized for its vivid whiteness, but it has always posed particular problems for the ceramicist using it. 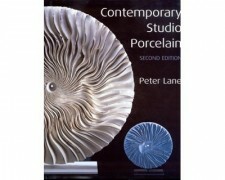 In Contemporary Studio Porcelain, Peter Lane provides a strong history and celebration of the development of porcelain at the turn of the new millennium. The international group of artists featured in this book demonstrates the confidence and versatility found in contemporary porcelain, resulting in a breathtaking look at the exciting and innovative work that is currently being done internationally in this field. Contemporary Studio Porcelain presents a wide diversity of porcelain objects that will both inspire and enthrall. This classic work, now substantially revised, is a must not only for any potter working in porcelain but also for collectors of fine ceramics.